Uncle Ken, Black Bears, and Birds! What do black bears and birds have in common, you might ask? Well, let me tell you. Besides the fact that they both love birdseed, they had my uncle in common. Klippels tend to be stubborn. My grandfather was stubborn, my mother was stubborn, her sister was stubborn, and my uncle, Kenneth Klippel, was stubborn. Now, that’s a lot of stubbornness! Mostly, it was stubborn in a good way … the kind of stubbornness that allows one to stick to their guns and get things done. Uncle Ken also enjoyed watching birds. Upon his retirement, he moved from Binghamton, NY to Raquette Lake where he settled into the camp he and my grandfather had built many years earlier. One of the first things he did was set up a bird feeder in the front yard. Nothing fancy. Just one of those shepherd’s hook-type metal supports with a bird feeder hanging from it. That is when the problems began! The first clue that this would become problematic was when he awoke early one morning to some strange noises on his screened-in front porch. Upon investigation, he discovered a young black bear had broken into his screen-in porch and was busily munching away on the large bag of wild bird seed Uncle Ken had stored there. Luckily, he was able to shoo the bear away. Subsequently, he began storing the bird seed in the old outhouse that had long been converted into a tool shed. Things seemed quiet after that and the problem seemed to be taken care of. At least, until the next spring! One evening, Uncle Ken returned from a fishing excursion into the north part of Raquette Lake. He and a few friends had left early in the morning to go fishing for Lake Trout. When they returned, and he pulled in to park at his camp, he noticed the bird-feeder support was pushed over, the bird feeder was pretty badly smashed up, and the bird seed was, of course, gone. 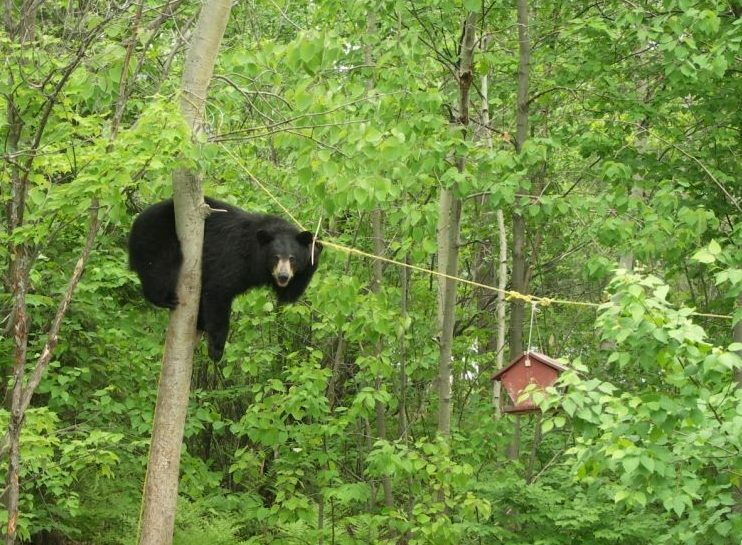 Nonplussed, he simply went into Old Forge and got a better support and a new bird feeder. The next day, the new birder feeder was in place, and his happy little feathered-friends were back. This however, was not the end of the story. Not by a long shot! The battle of the bird feeder quickly escalated and was waged over a period of several years. 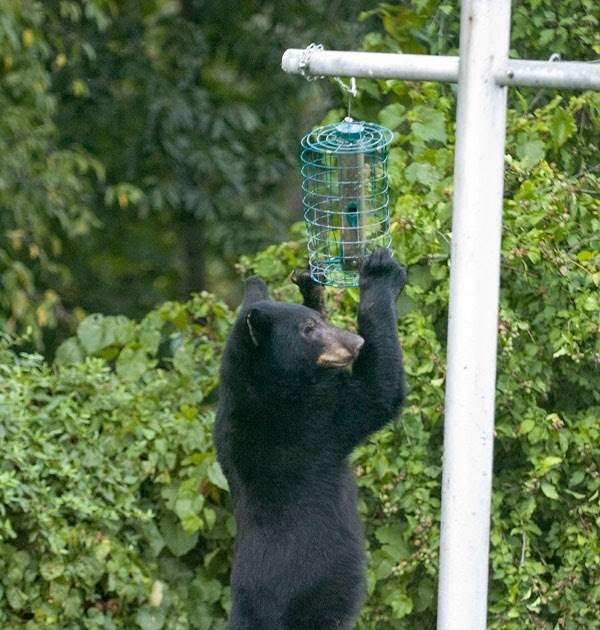 Several times the bird feeder was raided by a black bear and the bird seed eaten. Each time the bird feeder had to be replaced and the mounting system became more substantial each time. I still remember the year he’d tried to use a 4×4 post. Uncle Ken had dug a hole, set the 4×4 in it, and poured concrete around it for a strong base. I was staying at our camp for a week that summer and got to observer the construction project first hand. This time he’d seen the bear, and it was a big one. He was headed out for the day when he discover the bear in his front yard. The bear simply snapped the 4×4 over and began busily munching down on the bird seed that had once been in the now mangled bird feeder. Uncle Ken, angry now, went in to get his shotgun. The bear was gone when he returned. I guess the bear had decided that he’d over-stayed his welcome. Uncle Ken later told me that he really wasn’t going to shoot the bear, he just wanted to scare it off. Later that afternoon, he headed back to Old Forge for more concrete and a steel pole. “Something like a basketball goal post,” as he put it. When I headed back to Tennessee, he was out there re-digging the hole for the new “steel-pole” bird feeder base he was putting in. The battle is finally won … the birds lose! The next year I returned, only to notice that there was no bird feeder in place. Intrigued, I continued up to our camp, unloaded my gear, and then walked down the road to Uncle Ken’s camp to get, as Paul Harvey would say, “the rest of the story!” Uncle Ken was sitting on his screened-in porch when I walked up. I asked about the “goal-post” bird feeder. Uncle Ken just shook his head. He’d come home after a trip to Warrensburg to visit with a lady he’d become friendly with, only to find the metal post pushed over, the bird feeder demolished, and of course, the bird seed gone. “The bear just pushed the damn thing over, pulling the concrete base right out of the ground,” he explained. “At least, the bear had to work for it,” I observed, trying hard not to grin. I did know how stubborn he was and how much he hated losing, especially to a bear. “Are you going to try again?” I asked. If you enjoyed this story, check our the other Adirondack Bear Tale posts on my blog, or my military action/adventure novel, Serpents Underfoot, available at Amazon.com! Previous PostSuccess Secrets: Measure Twice, Cut OnceNext PostMathematics! Is It Really That Important! Another great bear story. Hope there are some more tales to be told. In the words of Jimmy Durante, “I got a million of them!” Well, maybe not a million … but a bunch! By the way,thank you for your button(click) “Nice”. I’m reading an Official document in 1951 May that Sir. MacArthur testified on Japan. He never testified that it was an invasion war. If you can not open this UPL, I paste for a while(I’m reading). This is soooooooooooo long!!!(T^T)!!! Hi Nasuko, Thank you for the comment and the information on General MacArthur. I will certainly take a look. I have always enjoyed military history.